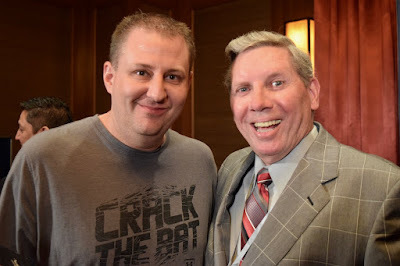 Curtis @BCHeron76's trip from Canada for @WPTDeepStacks $500,000 Guarantee Main Event and all the Grand Opening festivities just improved a bit. Four players to the flop with a limped pot. 3-3-7, two clubs goes the flop. First player makes it 1,025. The original bettor finds a fold and up go the cards. Player 4 slams his cards down and they scatter across the felt as he exhibits his ability to utter expletives, the Nine_Three, also all red, remain face up. The board runs out J-4, Larson is eliminated, Heron gets just about a full Triple and more expletives - along with a toss across the felt of the All-In button - come from Player 4. Methinks Player 4 is a tad unhappy.